Get used to seeing this a lot more often on Legends of Tomorrow next season. 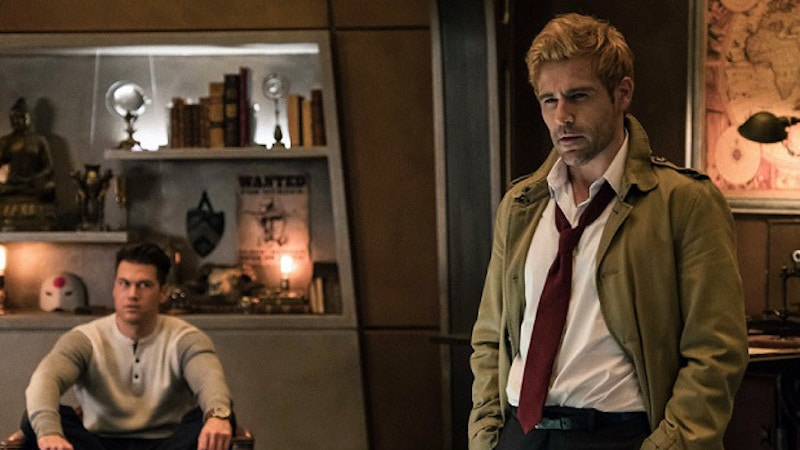 Summon the nastiest demon you can find and give them a high five, because John Constantine will board the Waverider permanently for Legends of Tomorrow’s fourth season. Here’s the catch though: Legends has to be renewed for a fourth season first. The Hollywood Reporter and Deadline are reporting that Matt Ryan will be promoted from recurring to a series regular, having made his debut on the show in the currently-airing third season. But, the promotion is contingent on Legends actually returning for a fourth season. The CW has yet to officially announce any renewals for its cadre of DC Comics shows just yet, so it’s essentially a waiting game for now. If Legends gets renewed—fingers crossed, but it’s very likely—this marks the culmination of a long road for Ryan’s take on the chain-smoking magic-wielder that started, and nearly ended, with the launch and rapid cancellation of Constantine on NBC. Since the show fizzled out, Ryan’s wholehearted embrace of the character has lead to appearances in DC animated movies and eventually a return to TV in the form of a guest appearance on Arrow. Last year the CW even announced a new animated series for its CW Seed service with the character, but at least we know he’s getting his dues in the live-action realm too. Are you excited for more Constantine?